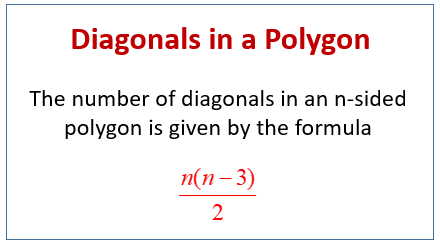 The following diagram gives the formula for the number of diagonals in an n-sided polygon. Scroll down the page for more examples and solutions. A diagonal is a segment that connects two non-consecutive vertices in a polygon. The number of diagonals in a polygon that can be drawn from any vertex in a polygon is three less than the number of sides. To find the total number of diagonals in a polygon, multiply the number of diagonals per vertex (n - 3) by the number of vertices, n, and divide by 2 (otherwise each diagonal is counted twice). How to determine the number of diagonals in a polygon. How to determine the number of handshakes possible in a group of certain number of people.